Our organization is an eminent name, which is engaged in delivering Laboratory Filter Paper to the respectable clients. The offered range of laboratory filter papers is available in various specifications to cater to the diverse requirements of esteemed clients. In addition to this, the offered range of laboratory filter papers is inspected on different characteristics to ensure its adherence with the international quality norms and standards. 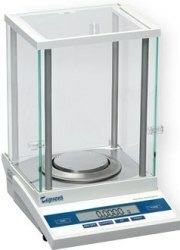 We also offer laboratory glassware, laboratory plastic ware and laboratory instrument. 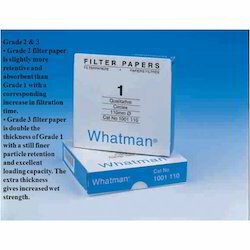 We are an eminent name, which is engaged in delivering Whatman Filter Paper at clients' premises. The offered range of filter papers is manufactured utilizing high grade raw material and innovative technology by dependable vendors of the market. Along with this, the offered range of filter papers is applicable in R&D institutes, pharmaceuticals, analytical test laboratories and chemical companies. Our wide range of products includes Syringe Filters and is used to purify the syringe by filling the syringe with the mixture and by forcing the mixture fluid out through this filter. These products are widely used in hospitals, nursing homes, laboratory, educational institutes and forensic labs. Before supplying our products to our clients we check the quality of the products to ensure that we are supplying the superior products to our customers. We are an incomparable name in offering a superior quality Ashless Filters which are widely used to separate fine solids from liquids or air. Our offered ashless filter is well appreciated in the market for it salient features such as excellent quality, high filtering power and air permeability. Our ashless filter is used between the liquid or air pressure systems for removing the fine particles. These Stirrers are specially designed brushless AC variable speed stirrers driven by frequency inverter to ensure reproducible speed with any load. Model RQ-140/D-FP is with flame proof motor & frequency inverter inside flameproof enclosure, suitable for use in Group II A & II B hazardous areas. These stirrers have steady & constant speed for viscous materials and solutions that change viscosity during mixing. They have built in digital RPM indicator for process validation and reproducibility. Designed for homogenization, emulsification and dispersion and mixing of fluids at high speed. The user has a choice of selecting from AC Drive or AC/DC Drive with stepless speed regulations for continuous variation of speed as per requirements. 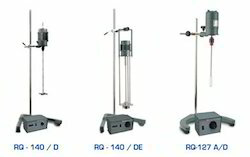 RQ-127A/D suitable for homogenizing of tissues at high speed available. Chuck to hold shaft upto 10 mm dia. fitted with Teflon grinding pestle (50 ml). 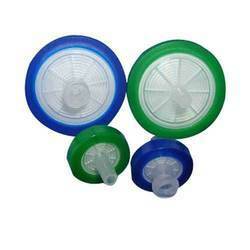 Glass homogenising cup with rod supplied as standard, optional available 5 ml, 15 ml, 25 ml. & 100 ml. RQ-127/D, RQ-130/D, RQ-130B/D are with AC / DC motor, these units are 3 bladed impeller (optional Saw Cutter) housed in flange type cage.Optional digital speed indicator for precise setting of speed in RQT Models. RQ-140 / DE specially designed brushless AC variable speed Emulsifier driven by frequency inverter to ensure reproducible speed with any load. Steady & constant speed ideal for solutions that change viscosity during mixing. Emulsifier has built in digital RPM indicator for process validation and reproducibility. 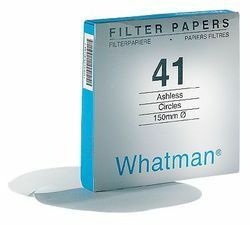 Whatman offers two types of glass microfiber filters manufactured from 100% borosilicate glass: binder free glass microfiber that is chemically inert and binder glass microfiber. These depth filters combine fast flow rates with high loading capacity and the retention of very fine particle, extending into the sub-micron range. Glass microfiber filters can be used at temperatures up to 500°C and are ideal for use in applications involving air filtration and for gravimetric analysis of volatile materials where ignition is involved. 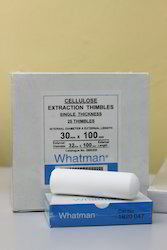 Whatman glass microfiber filters have a fine capillary structure and can absorb significantly larger quantities of water than an equivalent cellulose filter, making them suitable for spot tests and liquid scintillation counting methods. 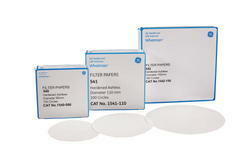 The filters can also be made completely transparent for subsequent microscopic examination. The particle loading capacity of a filtration system can be greatly increased by using a pre filter. 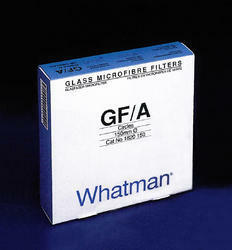 Whatman glass microfiber filters such as GF/B or GF/D are suited because of the low resistance to fluid flow and high particle loading capacity. Whatman Multigrade GMF 150 is particularly valuable for the pre filtration of larger volumes and solutions that are normally difficult to filter. We bring forth for our clients excellent quality of Filter Paper with the best quality. These papers are processed by making use of optimum quality basic pulp material and advanced technology under the strict industry laid norms. Our offered papers are available in different specifications to meet the requirements of the clients. Furthermore, we offer these papers at pocket-friendly prices to the end user. We are the reckoned organization for offering top quality Ashless Filter Paper that is widely used in pharmaceutical, food and chemical industry for removing any type of contamination from liquids. 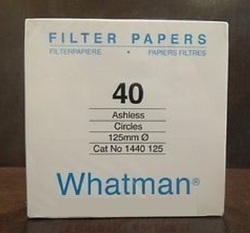 This filter paper is manufactured with wooden or fiber pulps. Offered filter paper is used between the liquid or air pressure systems for removing the fine particles. The offered filter paper is available in different porosities and sizes for use in the multiple processes. We are amongst the leading industry in the domain, engaged in offering high quality Extraction Thimbles. Due to the convenience of usage and durability, the range is extensively used for solid-liquid extraction technique. These extraction thimbles offer a safe, convenient and efficient method of solvent extraction. The offered extraction thimbles find usage in analysis of fats or pesticides in foods and soil material. After years of experience in the particular field, we are offering our esteemed customers with high quality Membrane Filter Paper. Membrane Filter Paper are polymer films with specific core ratings. Advanced Membrane Filter Papers are manufactured in ISO certified facilities. The products are available in a variety of polymers, pore sizes, diameters and surface sizes. Moreover they are available at very reasonable prices. * Polyfunction: % weigth, counting, fill mode, GSM etc.